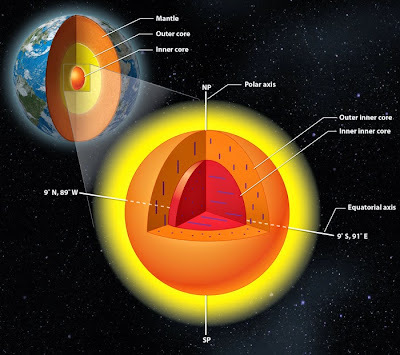 Scientists have discovered an additional core inside the Earth's inner core. The team published their discovery in the journal Nature Geoscience. Using seismic waves, researchers from the University of Illinois and Nanjing University in China have discovered that the inner core of the Earth has an inner core of its own. It is previously known that the inner core of the Earth contains iron crystals that are aligned in a north to south direction. The newly discovered core has crystals aligned in a east to west direction. The core was discovered using seismic waves are energy waves generated from an earthquake or loud explosions that passes through the Earth . Using principles similar to ultrasound, the team used seismic sensors to collect data from a seismic wave produced during an earthquake's aftermath. The discovered core is smaller than the moon and may give information on how the Earth was formed, its history and an understanding what is happening deep inside the planet. Seismic waves are helping scientists to plumb the world's deepest mystery: the planet's inner core. Thanks to a novel application of earthquake-reading technology, a research team at the University of Illinois and colleagues at Nanjing University in China have found that the Earth's inner core has an inner core of its own, which has surprising properties that could reveal information about our planet. "Even though the inner core is small - smaller than the moon - it has some really interesting features," said Song. "It may tell us about how our planet formed, its history, and other dynamic processes of the Earth. It shapes our understanding of what's going on deep inside the Earth." Researchers use seismic waves from earthquakes to scan below the planet's surface, much like doctors use ultrasound to see inside patients. The team used a technology that gathers data not from the initial shock of an earthquake, but from the waves that resonate in the earthquake's aftermath. The earthquake is like a hammer striking a bell; much like a listener hears the clear tone that resonates after the bell strike, seismic sensors collect a coherent signal in the earthquake's coda. "It turns out the coherent signal enhanced by the technology is clearer than the ring itself," said Song. "The basic idea of the method has been around for a while, and people have used it for other kinds of studies near the surface. But we are looking all the way through the center of the Earth." Looking through the core revealed a surprise at the center of the planet - though not of the type envisioned by novelist Jules Verne. "The fact that we have two regions that are distinctly different may tell us something about how the inner core has been evolving," Song said. "For example, over the history of the Earth, the inner core might have had a very dramatic change in its deformation regime. It might hold the key to how the planet has evolved. We are right in the center - literally, the center of the Earth."